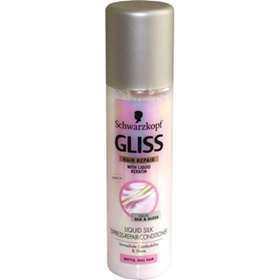 Schwarzkopf Gliss Liquid Silk Express Repair Conditioner Spray 200ml is a leave-in spray that contains elements of silk, leaving your hair silky smooth. Designed to revive dry, brittle hair. Contains liquid elements of silk. Silky suppleness and breathtaking shine. Shake before use. Spray into towel dried hair or dry hair after washing and leave to soak into the hair. If contact with eyes occurs, rinse with clean water. Aqua, cyclomethicone, phenyl trimethicone, prunus armeniaca kernel oil, hydrolyzed silk, sericin, panthenol, cocodimonium hydroxypropyl hydrolyzed keratin, hydrolyzed keratin, dimethicinik, cetyl PEG/PPG-10/1 dimethicone, lactic acid, polyquaternium-16, laurdimonium hydroxypropyl hydrolyzed wheat protein, cetrimonium chloride, parfum, sodium benzoate, limonene, phenoxyethanol, hexyl cinnamal, citronellol, coumarin, linalool.